Rose–a precocious young girl in 1930s Wisconsin–runs away from home to avoid going onto high school and what she sees as a certain path to marriage and motherhood. What she seeks is adventure. What she finds is much more. Rosebloom takes place at a time in history that buffets Rose between the Great Depression and the coming wave of World War II. She gets herself into situations through her naiveté, and also just by chance, that test her resolve and teach her not only about herself but about the world of others, which she would have never know if she hadn’t left her small farm in Southwest Wisconsin. In 1936, 16-year-old Rose runs away from her hometown of Crawford County , WI , to see some of the world before entering high school. Her journey via riverboat from Wisconsin to Missouri to Louisiana , from all-black sections of segregated towns to a house of ill repute, takes Rose through her first love and her eventual arrival at womanhood. Considering the setting, Rose is much more naive about race relations than she perhaps should be, but debut novelist Keleny details her journey and the myriad characters she encounters in an entertaining an enjoyable way. Narrator Adam Seeger uses his abundant vocal techniques to highlight the style of the times between the Great Depression and World War II. Recommended. [The self-published pb won a 2008 Independent Publisher Book Award and is only now available on audio; more at rosebloombook.com.—Ed. ]—Terry Ann Lawler, Phoenix P.L. Library Journal Review, 2/1/11 edition. (libraryjournal.com) Review of the audio book. When I was thinking of writing a story, I started out with the idea of trying to somehow portray the wonderful, complex, different… relationships that women can have with each other. I am biased, of course, but I think women have a special bond, and if they are willing to share (and they seem more able to do that then most men, in my opinion), it can be a very wonderful experience. I wanted to somehow put that down in to words. I’m not sure what made me put Rose on the Mississippi, it was too long ago when I cooked up this initial idea to recall. But I probably wanted to share some of what my father felt when as a young man of 19, he and his good friend, Ray Hadwick, took a canoe down part of the Wisconsin River, then the Mississippi from Prairie du Chien all the way to New Orleans. I have a small diary in his scratchy script of just that event. It is fun to read how they stayed in their tent along the river, fishing for food, stopping to pick up money wired from home, and occasionally taking a room for a warm or dry place to sleep for a whopping 50 cents a night, or the watermelon they picked up for pennies and ate to their hearts content. My mother has a great picture of my Dad, trim and muscle bound in his swimming suit, paddle in hand as he stood along side of that mighty river; a river that, for that summer, had sculpted him into an Adonis with a camera that captured him in black and white. Once I started writing and doing the long, enjoyable hours of research, things started happening. I then knew this was a story that was meant to be. There were just too many coincidences, just too many things that fell into my lap over the approximate 5 years of its birth. The first one was my choice of riverboats. I had found a wonderful book about the life of a woman on a farm in Crawford County Wisconsin at a local library. (I wonderful story I can not again find, I’m afraid. I wanted to include it in my bibliography, but the library where I found it moved, so the section in the library where I found it moved too, and I think they may have placed it in a different section of the library at their new location.) I’d love to give it credit since it started me on this path and gave me a lot of good material on farm life during the ‘30s. The choice of this book sent me to Prairie du Chien, since this was the closest large town my character would have access to (as the character in this lost book). When I was going through the Courier-Prairie’s local paper-, I came upon the exact ad I have placed in my book–an ad for an evening excursion on the deluxe steamer, the Capital. At another point in time I took a trip along the river and ended up in Savanna, Illinois. I’m not sure why I picked Savanna, but when Dorothy, at the railroad museum–in the rail car by the river–put the local book of Savanna history in my hands and I found a picture of the Capital moored along it’s shores, I knew I was onto something. Then there is the day a spry 80 something woman (I’ll keep her real age to my death!) was put on my schedule at work. 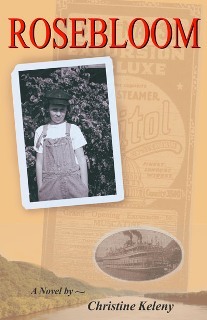 Louise happened to be a teenager in the late 1930s in St. Louis. She was able to fill in some details of the historic town that I couldn’t get in books or from my trip there to see the wonderful sites that I have described in my book. The place feels like a sleeping giant. There is so much there, so much history, so much beauty, so much to say, but I never had a clue (other than the usual trip to the arch that most folks take). I can see why Louise loves it. I was somehow put in touch with a wonderful librarian, Bette Gordon, who is in charge of the Mercantile Library at the U of Missouri at St. Louis. (Isn’t that a mouthful to put on a business card!). Before I was able to visit the library itself, Bette put me in contact with a wonderful man by the name of Henry Evans. Henry had studied the steamer Capital, so he could build an exact replica of it. How wonderful is that! This was after I was only able to find a few outside pictures of the beautiful boat. And just before I had finished writing my story, Bette gave me Anne Blum who put me in contact with Mary Otte–a wonderful 94 year old young woman who worked on the Capital in the 30s (Mary wouldn’t mind me telling you her age). My husband got in on all this by telling a woman, Angela Gaisor, who was doing an interview with my husband about our work in El Salvador for an engineering magazine for UW Platteville, his alma mater. I’m not sure why he mentioned that I was writing a story about a girl who lives outside of Prairie du Chien, but he did. Well, so happens that Angie’s grandparents live in Prairie and were teenagers in the late 1930s. Interesting, no? They are sweet people, of course, and she was sure they would be happy to talk to me. Well, Earl and Marilyn are sweet, and they were very willing to share what they remembered so many years ago. It also so happens that their daughter and son-in-law own the old Metro theatre and sure, they’d be willing to show me around. When I stepped through the old glass door I could tell they expected me. Marilyn had called and told them I was coming. I was also lucky enough to take a trip with my husband to New Orleans in 2004, before hurricane Katrina. He was going there for a work conference, so I was able to tag along and do more research. It too is (or was) a historically rich city that I was only able to scratch the surface of. Unfortunately, I’m not sure some of the places I saw are even still there. Very sad indeed to loose that deep heritage. I hope it’s not all gone! All this plus many trips to the Wisconsin State Historical Society in Madison, and to my local library… and Rosebloom was born. I hope you enjoy reading it as much as I enjoyed writing it!